1. You aren’t having a drug induced hallucination. That Hunter S. Thompson Fear and Loathing tee and a number of other rarities are up for grabs at DoubleSixVintage. 2. Thankya, thankya very much, KosherCollectibles, for listing an amazing array of vintage tees originating as far back as the 1930s. 3. Regardless of where you were born, check out Kayo, who just started to list over 80 different Boss shirts and other interesting Bruce related memorabilia. 4. Vintage Vantage are being excellent to us with a 50% off sale on all of their Top Shelf items. Even their infamous RUN DMC/Adidas shirt is now chump change at $6,500. 5. Lock your doors at night, VintagePimps are back on the streets and have a knock out selection of reasonably priced pop culture tees. 6. 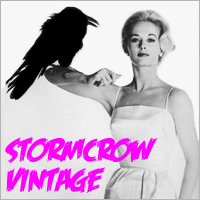 Wyco_Vintage has just unleashed roughly 50 auctions all beginning at .99 cents. If you have any sense you’ll get over there right now. 7. Don’t forget about our 50% off sale – it’s going on until the end of January.